Consider Hong Kong’s best cover bands and stalwart rockers Don’t Panic will surely make the list. 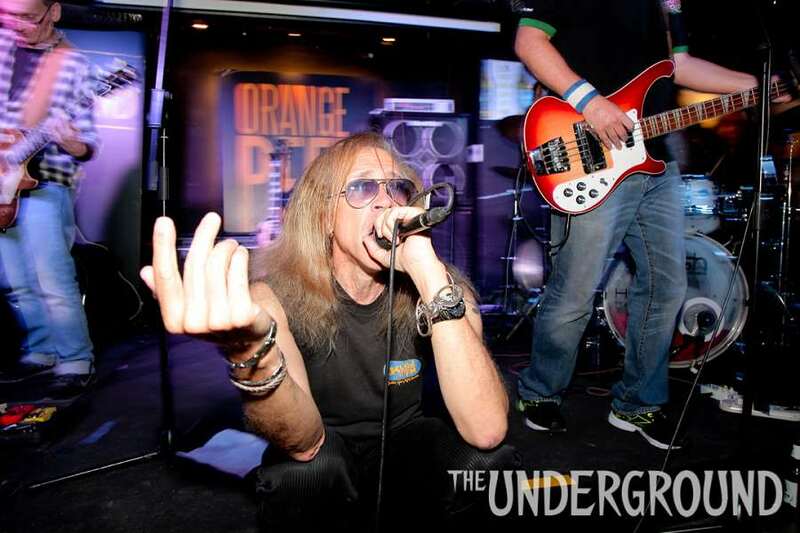 They do perform originals, but it is their covers of bands like REM and Black Sabbath that have drunken punters roaring down the microphone on Saturday night in Wanchai. The band’s performance at Uncovered Again was testament to the unifying power of a good song everyone knows the words to. Regular patrons of The Wanch will have heard most of the songs sprinkled into the band’s shows before, but such rousing rock hits never fail to get the room moving. Lead singer John Prymmer was a little under the weather with the flu, but didn’t let a few sniffles get in the way of his legendary, Jagger-esque showmanship as the band ploughed through party-starting anthems and newer classics. A relentless ball of energy, Prymmer leapt off the stage, ran around the room, and performed sitting on the sofas at the side. He caught a breather when bassist Geoff Wheeler took over the vocals for a more classically-styled take on The Killers’ Somebody Told Me and REM’s beloved Losing My Religion. By the time U2’s The Fly arrived, most of the audience was on their feet and moving ready for Don’t Panic’s take on The Police’s Can’t Stand Losing You and The Vapors’ Turning Japanese. Well-worn favourites sat alongside rock’s relative newcomers in a fun, often chaotic set of pure rock ‘n’roll spirit. It was business as usual for the rockers, who proved their charm extends beyond Jaffe Road, and that they’re one of the city’s most popular live acts wherever they play. Don’t Panic is a band I’ve been watching play almost ever since I was inducted into the local music scene (they’ve been around for MANY more years than that, though) and I’ve seen them many times over these years. So have many other regulars of the scene, who also have repeatedly watched them live numerous times, and there is good reason for this: they’re hard to get bored of. They’ve played religiously for hours a night, nearly every single week, to crowds of all sizes and natures, and I can swear that they’ve entertained all of them. However, a band made up of people as obviously skilled as them has had a set of original songs a long time coming, and this was, to my knowledge, one of the few times that they have focussed on playing their own songs, so I was a bit anxious and quite excited to hear what they’d sound like (though I had heard a couple of their songs at an earlier gig). And they didn’t disappoint. Theirs is a heavy, slightly 80s metal feel to their songs, in terms of the chromaticity of the notes they use – they tend to use a similar chugging rhythm and bright notes to back up the two vocalists’ also-quite bright voices to create a rousing and energetic sound that’s engaging and immediately engaging. Now, I don’t think they make any bones about wanting to make the sort-of straight ahead rock ‘n’ roll that accommodates few pretensions, which many bands do – the difference here is that they know how to use their talents to do this well, which is hard to do in a style that’s so oversubscribed. There are fast and flashy solos and imposing drums, but they’re brought to the fore judiciously, making them interesting rather than wearing out their welcome. The singers’ voices work interestingly in alternation, with John having a more classic rock ‘n’ roll/metal voice, fond of the high notes like Rob Halford’s is, while Geoff’s is a more poppy, cleaner voice that brings out the slightly lower-pitched songs well. Blue Cars was a broody, dark number with some very intense solos, whileClothes was a more rock ballad-like, sounding a bit like the late-70s Kinks. Climber was reminiscent of early REM (including a not-entirely-unjustified whinge about the night’s drinks’ prices) and Gift was an ominous, shreddy yet full of feeling song, in which the guitars really stood out for having walked the line between those two aspects to near-perfection. It wouldn’t have been a Don’t Panic set, though, if there weren’t a few covers, and the selection seemed to have been made to warm my own heart – Foo Fighters, Black Sabbath and Rolling Stones songs that are staples of their regular sets, and which they have refined their renditions of were made even more delightful by Chris B joining them on stage. Now, I never stopped to think what Sympathy for the Devil would sound like in a deep, woman’s voice, but as it turns out it’s pretty damn good. The twist given to the song was really neat, and with Don’t Panic’s general atmosphere of let’s-all-let-our-hair-down, we couldn’t have had a better way to close the show. The more substantial taste Don’t Panic gave of their original music was, predictably, enticing – now I can’t wait for the album.